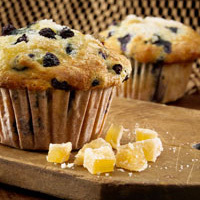 Get off to a healthy start with this delicious lemon, ginger and wild blueberry muffin. The frozen fresh wild blueberries create a perfectly rich, more intense blueberry flavor – and deliver twice the antioxidant power of regular blueberries. This is a muffin worth waking up for. In bowl combine flour, baking powder, baking soda and salt; reserve. In another bowl beat together buttermilk, egg substitute, sugar and oil; stir into flour mixture just to blend. Fold in Wild Blueberries, ginger and lemon zest. Scoop 1/4-cup batter into each greased 1/3-cup muffin tin. Sprinkle each muffin with sugar. Bake in 400°F conventional oven or 375°F convection oven 18 to 22 minutes or until firm to the touch. Serve warm. Yields approximately 36 muffins.